Isaac van Ostade (bapt. 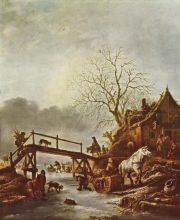 Jun 2, 1621, Haarlem - buried Oct 16, 1649, Haarlem) was a Dutch genre and landscape painter. 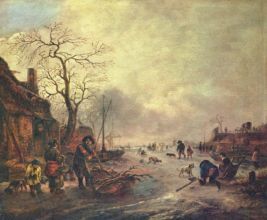 Van Ostade began his studies under his brother, Adriaen, with whom he remained till 1641, when he started his own practice. 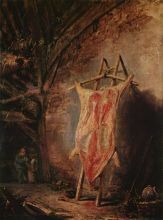 At an early period he felt the influence of Rembrandt, and this is apparent in a Slaughtered Pig of 1639, in the gallery of Augsburg. He soon found a style more suited to his own inclinations. 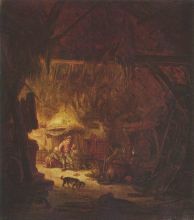 He produced pictures in 1641-1642 on the lines of his brother - amongst these, the Five Senses, which Adrian afterwards represented by a Man reading a Paper, a Peasant tasting Beer, a Rustic smearing his Sores with Ointment and a Countryman sniffing at a Snuff-box. 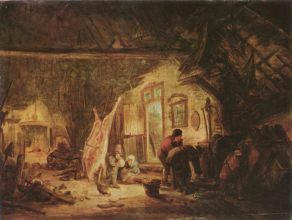 A specimen of Isaac's work at this period may be seen in the Laughing Boor with a Pot of Beer, in the museum of Amsterdam; the cottage interior, with two peasants and three children near a fire, in the Berlin museum; a Concert, with people listening to singers accompanied by a piper and flute player, and a Boor stealing a Kiss from a Woman, in the Lacaze collection at the Louvre.